HOSPITALS ACROSS THE country are hiding patients from trolley watch counters by clogging up other wards, it has been claimed. Senior hospital staff have said that patients in some of Ireland’s 52 hospitals are being moved to different wards at specific times of the day so they can avoid the INMO’s Trolley Watch figures, which are published daily, making it appear that hospitals are dealing better with the overcrowding crisis than they are. Some patients, according to frontline workers, are brought for scans and other diagnostic tests during the time where INMO nurses would usually conduct the count. TheJournal.ie can also reveal that late last year when Health Minister Simon Harris was visiting the new endscopy unit at Cork University Hospital, a number of patients were moved from trolleys into the theatre recovery room. “This was done to give the impression that there was nobody on trolleys. They were moved like jigsaw pieces”, one member of staff at CUH told TheJournal.ie. A similar incident is alleged to have happened during Leo Varadkar’s tenure as Health Minister. This time the accusations concerned Our Lady of Lourdes Hospital in Drogheda, Louth. Staff said patients were moved into a new modular unit, which was being unveiled by the then Minister in reaction to the overcrowding crisis at the hospital. The HSE at the time denied that patients were moved there specifically for the Minister’s visit. They said people were moved back into A&E on advice of doctors. Another way management is massaging figures within the 52 hospitals is by exploiting an admissions policy known as GP referrals. All hospitals have what is known as an Acute Medical Unit (AMU) which is where patients who have been referred to hospital by their GP will arrive first, skipping the wait in A&E due to the perceived severity of their condition. “What happens is that a number of patients who are on trolleys will be brought up to the AMU. So let’s say there’s 20 spots, for example, half of them would be taken up by trolley patients,” another hospital worker said. This is done between 7am and 8am as an INMO representative is carrying out the Trolley Watch figures. “This could effectively halve the numbers for that hospital. Now imagine that’s done in over 50 hospitals around the country,” the worker added. Last week, the INMO found that there was a record number of 612 patients, admitted for care, on trolleys. 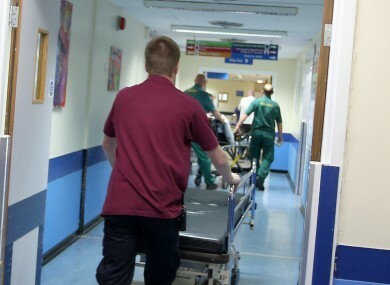 The record figure comes at a time when the Organisation’s Trolley andWard Watch analysis for last year confirmed there were 93,621 admitted patients on trolleys. INMO general secretary Liam Doran said: ”The stark reality is that in 2007, after it was declared a ‘National Emergency’, the number of patients on trolleys was recorded as 50,402. However, in 2016 this has increased by 86% to 93,621. This confirms that successive governments’ approach, to the public health service, have failed to address this problem and it must now become a top priority for a government wide response in 2017. The Journal.ie has contacted the Department of Health and the HSE for comment. The HSE released a statement late last week detailing their strategy to overcome the bed shortage. They said the €40 million winter initiative has seen over 4,000 patients have avail of community intervention services; over 3,400 patients have received aids and appliances; significant reduction in the number of delayed discharges; 625 additional homecare packages have been made available and over 300 additional transitional care beds. Email “How Ireland's hospitals are massaging the numbers of people on trolleys”. Feedback on “How Ireland's hospitals are massaging the numbers of people on trolleys”.